Stay Hungry. Stay Foolish. : Why are there (no) boundaries in human thinking? My recent blog on Admiration caused a discussion on why we love someone else. It's genuinely difficult to give an answer. It's not about reproduction as you don't actually need Love for that. Hence, it's not surprising that there is no clear definition for Love (eg, Wiki). The same issue applies to concepts like friendship (my 2016 blog) and the Universe. The ancient Greeks used 4 types of Love: Agápe (divine/spiritual), éros (romantic), philía (brotherly/sisterly), and storgē (parental). Today, an article claims there are (at least) 11 kinds of Love. 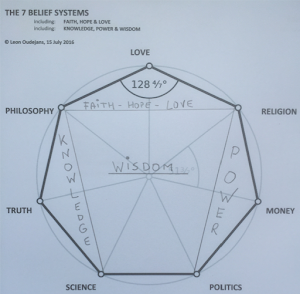 In my diagram on the How, What, When, Where, Who and Why of Love, I noticed a common answer: no boundaries. The reason why we struggle to understand the Universe is - probably - the same: its proportions appear to be infinite. Infinite is another word for no boundaries. Our minds have a problem visualizing the concept of infinity. Our conscious senses (eg, ears, eyes, smell, taste) only experience finite dimensions on this planet. We express these finite dimensions in length, width, height (Space) and minutes, hours, weeks, months, years and even light-years (Time). We struggle to understand - let alone accept - any other dimensions (eg, Multiverse) that are beyond our bodily senses. The term thinking outside the box "is thought to derive from management consultants in the 1970s and 1980s challenging their clients to solve the "nine dots" puzzle, whose solution requires some lateral thinking" (Wiki). Outside the box are no boundaries. There is one human area that thinks outside the box: our imagination (see my 2018 blog). Our non-conscious dreams and imagination are an example of unknown unknowns (my 2016 blog). 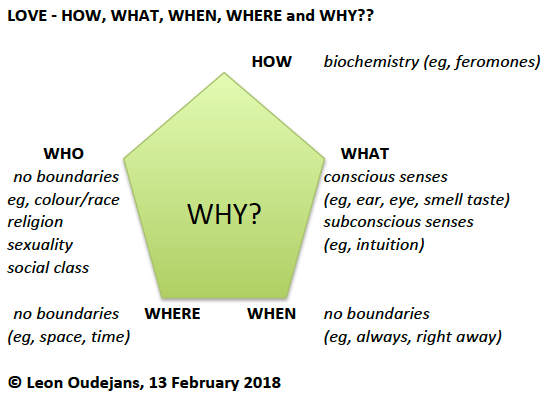 Our conscious world is, however, defined by known knowns (eg, facts, history), unknown knowns (eg, intuition, my 2016 blog) and known unknowns (eg, beliefs, my 2015 blog). Human inventions may seem an example of imagination. However, some of our (technological) inventions appear to be a copycat of things that we see in Nature: airplane (bird), armoured fighting vehicle (rhinoceros), ships (waterbirds), society (ants), solar power (flowers, trees), submarine (whale), and perhaps even the use of fire (black kites). “Imagination is more important than knowledge. For knowledge is limited to all we now know and understand, while imagination embraces the entire world, and all there ever will be to know and understand.” A quote by Albert Einstein.